College of the Siskiyous Spring 2019 Production - "Antigone"
Antigone by Sophocles, the ancient great 'resistance' drama, continues to be relevant even in our modern times. 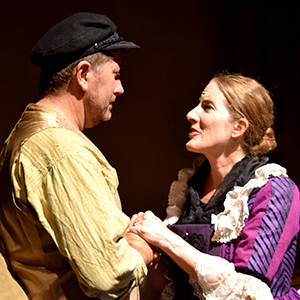 Cast and Crew alongside Director Neil Carpentier-Alting really combined their efforts to present their own twist on this tale of morality and duty in April of 2019 leaving many audience members stunned and touched by their performances. 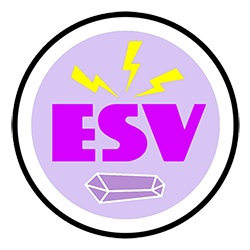 College of the Siskiyous Winter 2019 Production - "Electro-Magnetic Soul Vehicle"
"From between the atmospheric portal, we approach you. From the inner Earth, we call. From the deepest depth of the inner ocean, we arrive, The Electromagnetic Soul Vehicle." And with those words Dave Theno, local area musician and teacher, kicked off an epic adventure that took the cast and the audience to the lost city of Telos, located deep beneath beautiful Mt. Shasta. The journey introduced us to the legends of Telos, Atlantis, Rosalia, Adama, the greys, the lizard folk, with all original music and a band that was led by our own David Blink. The audiences were thrilled and seemed to completely embrace being part of this spectacle exploring local lore! 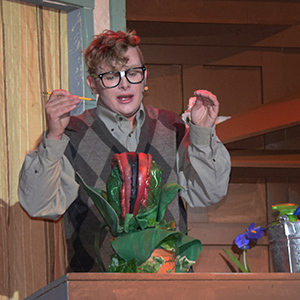 College of the Siskiyous Fall 2018 Production - "Little Shop of Horrors"
COS Performing Arts Department delighted and disturbed audiences with our November 2018 production of "Little Shop of Horrors"
A singing plant... a daring albeit reluctant hero... a sweet girl... a demented dentist. 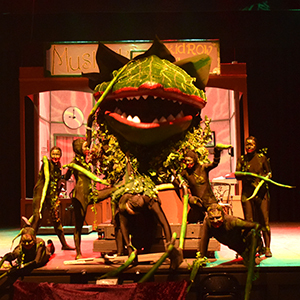 "Little Shop of Horrors" is the sci-fi smash musical devouring the hearts of audiences for over 30 years. "Little Shop of Horrors" has been a cult classic for years with the original movie released in 1960 and the Off-Broadway premiere in 1982. These were followed by the remake of the film in 1986 and finally, in 2003 it made its official Broadway debut. "Little Shop of Horrors" (Music by Alan Menken, Book and Lyrics by Howard Ashman) tells the story of a down-and-out floral assistant who becomes an overnight sensation when he discovers an exotic plant with a mysterious craving, his love for his co-worker, and how his plans go awry when the plant's demands grow a little too wild! 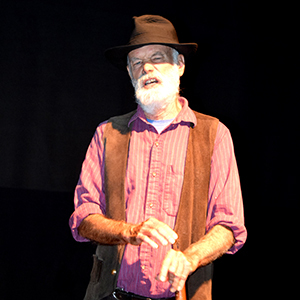 College of the Siskiyous Fall 2018 Production - "Walking with Walt"
In September of 2018 we performed a brand new show written by a local author. "Walking with Walt" was a delightful play written Tim Holt. It centers around the physical and emotional journey of Sam Marler, a West Coast dock worker who picks up a copy of Walt Whitman's "Leaves Of Grass" and is inspired by Whitman's poetry to quit his job and start walking across the country. He is accompanied by the great poet himself, who serves as Sam's guide and mentor. Sam's wanderings lead him back to his old hometown, where he soon gets caught up in a romance that began 30 years ago. But the lady in question has some scores to settle, and Sam's attempts to rekindle the romance get off to a rocky start. The show was performed in an intimate setting with both cast and audience members on the stage. 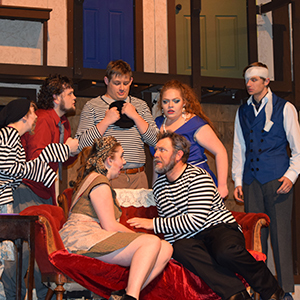 College of the Siskiyous Spring 2018 Production - "Noises Off"
The College of the Siskiyous' Theatre Department 2018 spring production of "Noises Off," a 1982 play by the English playwright Michael Frayn opened to wonderful reviews on the Kenneth W. Ford Theater stage Friday, April 14, 2018. Christian Richards directed this wildly popular farce! 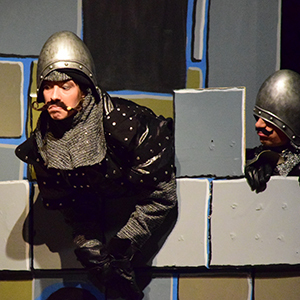 College of the Siskiyous Fall 2017 Production - "Spamalot"
The College of the Siskiyous Theatre Department presented our fall musical production of Spamalot in November 2017, written by Eric Idle and adapted from the 1975 film "Monty Python and the Holy Grail." Neil Carpentier-Alting directed this popular Broadway musical, together with Ron Slabbinck as Musical Director, and new COS theater faculty member, Christian Richards as Choreographer. 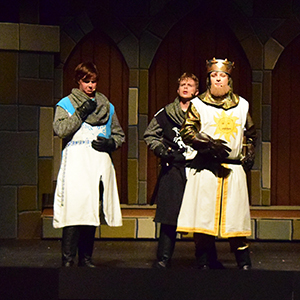 Several of the cast and crew of Spamalot were nominated for Irene Ryan awards at KCACTF Kennedy Center American College Theatre Festival which was attended by a group of students and faculty in early 2018. COS Summer 2017 Theatre Production of Shrek the Musical JR.
COS Theatre in association with Mt. Shasta Children's Theatre presented Shrek The Musical JR. in August of 2017 at COS’ Kenneth Ford Theatre. "Shrek's unique story of discovery encourages each of us to examine our prejudices, review what we believe to be our limitations and work to better understand ourselves and others. The actors and crew in this production have embarked on a similar journey, as students and teachers with many different interests have learned more about themselves and each other while collaborating towards the common goal of presenting this musical," says Freddie Gershon, CEO of Music Theatre International (MTI). 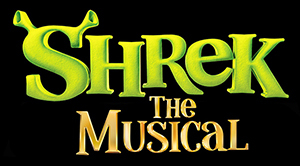 Shrek The Musical JR. was presented through special arrangement with Music Theatre International (MTI). All authorized performance materials are also supplied by MTI. Spring 2017 Productions - "Sorry, Wrong Number" and "The Water Engine"
The College of the Siskiyous' Theatre Department presented an evening of staged radio dramas, including Louise Fletcher's "Sorry, Wrong Number" and David Mamet's "The Water Engine," in April 2017 in the COS Kenneth Ford Theater at the Weed Campus. Many remember "Sorry, Wrong Number" as the classic 1948 film starring Barbara Stanwyck and Burt Lancaster. 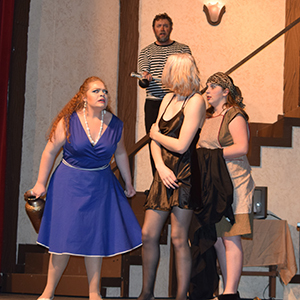 However, the College of the Siskiyous performed it in its original radio drama form. 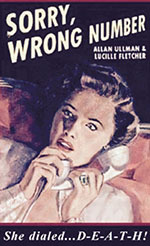 "Sorry, Wrong Number" is a mystery thriller which tells the story of a neurotic invalid, whose only contact with the outside world is her phone, and because of a crossed wire, hears the plans for a murder. This radio classic, originally done by Agnes Moorehead on Suspense, was one of radio's ten "bests" and is still being repeated as an outstanding study in suspense. "The Water Engine," set in 1934 during the Chicago World Fair, tells the story of a young inventor who has found a way to run an engine on distilled water. When he attempts to patent his invention he is at first ridiculed, but then is threatened when he refuses to sell and then decides to go public with his earth shattering discovery. The New York Times describes the play as "extraordinary... verbal brilliance" and the New York Daily News called it "a vivid theatrical experience." 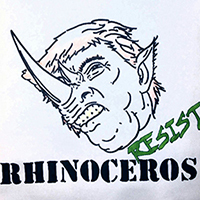 The College of the Siskiyous' Performing Arts Club presented Eugene Ionesco's raging absurdist political satire, Rhinoceros in February 2017 in the COS Kenneth Ford Theater. Ionesco wrote "Rhinoceros" in the late 1950's in Europe and is generally considered as a response and criticism to the sudden upsurge of Communism, Fascism, and Nazism during the events preceding World War II, and explores the themes of conformity, culture, mass movements, mob mentality, philosophy and morality. 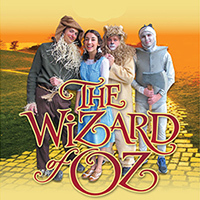 The COS Theatre and Music Departments co-produced the original script for The Wizard of Oz. All performances were held in the College of the Siskiyous Kenneth W. Ford Theater at the Weed Campus. For information about COS Theater productions or classes call (530) 938-5206. This original stage version of THE WIZARD OF OZ premiered at the Municipal Theatre of St. Louis (MUNY) in 1942. The first Muny production featured Evelyn Wycoff as Dorothy and Al Downing as the Munchkin Mayor. The musical includes songs "Over The Rainbow," "Munchkinland (Ding Dong! The Witch Is Dead)," "If I Only Had A Brain/A Heart/The Nerve," "We're Off To See The Wizard (Follow The Yellow Brick Road)," "The Jitterbug," and "The Merry Old Land of Oz," as well as a song called "Evening Star." Using L. Frank Baum's book – and not the MGM film – as its source, this version employs story and songs as elements of a classic stage musical. This original script also includes the characters of Gloria and Lord Growlie.